August | 2011 | WHAT A FEELING! Because jaw-dropping is a relatively rare occurrence at movies these days, let us not take the new Hong Kong offering The Killer lightly. For this is a movie that will have audiences sitting open-mouthed in astonishment. The source of this astonishment is multifaceted. Most spectacularly, there is the film’s incredible violence, with a body count that makes Arnold Schwarzenegger’s movies look like My Dinner with Andre. In this cartoonish world, human targets are shot to pieces with a fervor that is truly deranged. 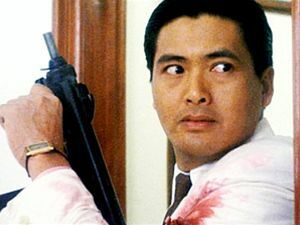 Then there is the story, a potboiler about a hit man (played by Hong Kong superstar Chow Yun-Fat) who comes out of retirement to perform one last job. In the process, he gets double-crossed and causes the blinding of a beautiful lounge singer (Sally Yeh), with whom he then falls in love. A detective (Danny Lee) gets on the case and eventually comes to such a close understanding of his adversary that you half expect the two of them to ride off into the sunset together. Anyway, the sunset is obscured by the hail of bullets and the river of blood that accompany the finale, a showdown in a church (praise the Lord and pass the ammunition—lots of it). In the felicitous phrase of critic Richard Corliss, all of this put together creates “a severely inane melodrama.” The aggressively B-movie plot and dialogue (the male-bonding scenes between criminal and cop being especially hilarious) are crude beyond belief. And yet, director John Woo and producer Tsui Hark (two of the leaders of the currently wild Hong Kong film scene) are so sure-footed and so swift that they carry you along in the film’s bloody wake. As ludicrous as much of the movie is, I couldn’t help sitting there with a grin on my face—that is, when my jaw wasn’t dropping. Supposedly this movie was threatened with an X rating from the increasingly irrelevant MPAA ratings board. (It is being released without any rating.) An X seems silly under these circumstances, because the violence here is completely unreal; The Killer is as much a Nintendo game as a movie. It’s more than Nintendo, duh. Wonderful movie, and this was a great era of discovery when it comes to the Hong Kong cinema. I interviewed John Woo once a few years later—a dapper, elegant fellow—and sometimes I often wonder whether his transition to Hollywood filmmaker forced him into a naturalistic style that just doesn’t suit him very well. Some moviemakers need to be untethered from all that. There hasn’t been such a major shake-up in the James Bond universe since 1969, when a new actor was introduced as the elegant spy. That time, it was the soon-to-be-forgotten George Lazenby who stepped into Sean Connery’s shoes. He only lasted the one outing; Connery came back for one more, then was replaced by the safe, sleepy Roger Moore, who dominated the lucrative series through 1985’s A View to a Kill. Now, it’s time for another, lesser-known actor to assume the license to kill. Timothy Dalton, 40, is the new 007, a Welsh-born actor with considerable stage and some movie experience. Dalton’s introduction in The Living Daylights occurs in one of those all-out stunt sequences that begin every Bond movie—this time a romp across the Rock of Gibraltar. Dalton’s got the physical requirements for the role—he can leap onto moving trucks, duke it out with bad guys, hang from the back of a plane at 10,000 feet. But can he order a vodka martini “shaken, not stirred,” and make it sound authentic? Although his leading nose and slitty eyes make him look a little like a duck at first glance, Dalton slips into the Bond persona with grace. And something more—this is a Bond with more gravity, more guts. Dalton brings a renewed depth to the Bond character. This is not exactly difficult, since Moore’s main strength as the previous Bond was his facility in wearing a white tuxedo as though he’d been born in one. Moore’s superficiality cued the Bond movies into increased frivolousness. 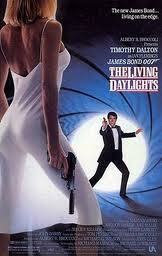 The Living Daylights restores some of the flesh of the original Ian Fleming novels. And the film itself is closer to Fleming’s spirit than usual. The filmmakers—producer Albert “Cubby” Broccoli, director John Glen, writers Richard Maibuam and Michael G. Wilson—are all veterans of the series, and they seem to have deliberately sacrificed some of the jokiness in order to get Bond back on track. For instance, the story here is a very traditional espionage tale about a Soviet defector (Jeroen Krabbe) who leads 007 into a tangled web of arms dealers, led by an American quasi-military man (Joe Don Baker) whose arms-selling adventures are reminiscent of some of Oliver North’s exploits. These are not bloated, cartoonish villains, although there is certainly some fun had at their expense. The film even nods to the espionage-movie tradition by playing a scene in a Ferris wheel in Vienna, the same setting for a memorable scene in The Third Man. More significantly, the usual bevy of Bond babes is banished. Excluding the bit of crumpet from the opening sequence, Bond sticks to one woman throughout, a cellist (Maryam D’Abo) who accompanies him on his adventures. The old formula had 007 bedding at least three women per movie. Some have suggested that this is the “post-AIDS Bond,” but perhaps it also signals more maturity for the character. The filmmakers haven’t thrown away their entire bag of tricks. The gadgets are here, including a laser-equipped Aston Martin and a key ring that exudes a deadly gas when the opening bars of “Hail, Brittania” are whistled. The film does the standard globe-hopping, ranging from Czechoslovakia to Morocco to sunny Afghanistan. And what would a Bond movie be without one of Maurice Binder’s corny credits sequences? Having lauded the film for moving Bond in more ambitious directions, I have to admit that The Living Daylights drags a bit. The stunt sequences are still good, but elsewhere things do get slow at times. Perhaps a new director could be brought in next go-round to pep things up. But keep the new Bond. Yeah, Dalton had everything except movie-starness. This one was, as suggested, an invigorating change from the previous Bond phase, though not as galvanizing a transition as Casino Royalein 2006. And maturity in James Bond? That is not the goal, exactly, as seasoned as Dalton and Daniel Craig might be. Also, I forgot to mention the theme song, performed by A-ha. I wonder why. Things are quiet out at the Bates Motel, since that bad business a few years back. Oh, customers are infrequent, but then it’s been like that since they put in the new highway a few miles away. In a way, that’s probably a good thing. The proprietor, Norman, continues to recover. He got through the murderous split personality of Psycho and survived a shaky rehabilitation in Psycho II. Now we find him back home, working at his favorite hobby: stuffing birds with sawdust with one hand, reaching for a peanut-butter cracker with the other. It can’t last, of course. Norman Bates (Anthony Perkins) collects insects, even though he wouldn’t hurt a fly. In Psycho III, which Perkins himself directed, trouble comes in the form of a wandering nun (Diana Scarwid), who carries some sexual attractiveness as well as a vague physical reminder of Marion Crane, the ill-fated character played by Janet Leigh in the 1960 original. What poor Norman is doing, as always, is fighting the nasty influence of his mother, whose body is still stuffed in an upstairs bedroom and who still seems determined to screw up Norman’s love life. But there’s another scoundrel on the scene, a drifter (Jeff Fahey) who’s trying to get too friendly with Scarwid. The combination of things pushes Norman over the edge, again. Perkins has made this Psycho much in the spirit of its predecessors—he obviously understands the idiosyncrasies of the series. Especially skillfully achieved is the blend of jump-out-of-your-chair horror with very dry humor. On top of that, Perkins actually captures a few moments of tenderness between his character and Scarwid, as though these two bruised souls had finally found a soul mate. Perkins’ care in keeping the characters true prevents the film from turning into a mere campy romp (as was also the case with Psycho II, directed by Richard Franklin). As it is, the picture is a great deal of fun—more sheerly enjoyable than any Hollywood movie released so far this summer. Neither of the two sequels is as pure or innovative as the Hitchcock original, but both have been solidly entertaining, and respectful of the original without being too reverent. The famous shower scene is referred to here, but with a twist. A phone booth figures prominently, though I shouldn’t disclose how, and there’s this ice chest that provides a final resting place for someone, in a marvelously gruesome send-off. After what Norman Bates goes through this time, it’s to be hoped that he finds some peace. Don’t bet on it, though; if Psycho III is as popular as it deserves to be, the Universal executives may decide to intrude on Norman’s quiet existence once again. I’ve never seen it again, but this movie made a great first impression. It had a buoyant World Premiere showing at the Seattle International Film Festival that year, with Anthony Perkins in attendance (I got to interview Perkins for an hour, in the day when you could actually sit and have a wide-ranging conversation with an interview subject for that long, and it was one of the most interesting interviews I’ve ever done). The film certainly gave off directorial confidence, and a strong sense of humor. It’s a drag that Perkins only directed once more, with the unmemorable Lucky Stiffs, but at least he made his peace with Norman after a couple of decades of being dominated by the role. 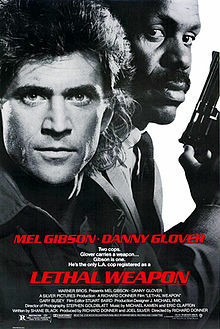 Lethal Weapon is Hollywood filmmaking at its most muscular. Also, unfortunately, at its least original. The latter stems from the buddy-cop formula that has proven popular, especially lately. It’s a predictable mismatch: The 50-year-old veteran (Danny Glover) draws duty with a young pistol (Mel Gibson) who’s had suicidal tendencies since the death of his wife. Gibson’s a hotshot, given to recklessness on duty (in these movies, this is almost always qualified by someone saying, “But hey, he’s a good cop”). When he confronts a guy threatening to commit suicide by jumping off a rooftop, Gibson claps the cuffs on the bewildered man and takes the jump—onto the huge air cushion in the street below. Glover, a family man, goes by the book and doesn’t like to unholster his gun. The last thing he wants is a livewire beside him. Got the picture? You and a million other screenwriters. He’s loaded the movie with detestable villains—notably a trimmed-down, platinum-haired Gary Busey—and some incredible hardware. Naturally, the villains and the hardware come together in an extended bloodletting climax, and they all get blown up good. In fact, Lethal Weapon may set some sort of record for the phenomenon of wasting every single villain by the time it’s over. All of these things, assembled and weighed like a fine machine, make for an effective package. It’s sure to be a hit, and there’s already industry talk of a sequel. But there’s also something cold about its slickness, as though it were just a bit too well-oiled for its own good. Yes, the buddy-cop movie was already worn out by the time the first Lethal Weapon movie opened. And indeed it was a big hit—there was no missing its appeal—and it launched not only one of the signature franchises of the time but dozens of knock-offs. I have never revisited any of the LW pictures, and I’m all right with that. Strange, the way bad word-of-mouth gets around. It’s a mysterious process that can taint a movie, even before the movie opens. Ishtar, for example, was dead in the water earlier this year, long before it appeared in a theater near you. And it wasn’t really that bad. Now, another film from Columbia Pictures has been attracting a similar kind of negative buzz. Bill Cosby’s Leonard Part 6 has been the source of much insider groaning lately, and even Cosby has been distancing himself from the film. It will be interesting to see whether Leonard opens to weak business, or if Cosby’s popularity carries it through its first weekend. The movie isn’t quite the unmitigated disaster it’s been rumored to be. It isn’t completely incoherent, and it mercifully contains only one obnoxious plug for Coca-Cola (Cosby’s frequent employer and the owner of Columbia Pictures). It is, however, a bore. Cosby, who once starred with Robert Culp in “I Spy,” here plays Leonard, an ex-spy; rich and retired, Leonard spends his days showering in Perrier water. Little does he know, he’s about to become the spy who came in from the shtick. The CIA chief (Joe Don Baker) calls Leonard back to service to help topple a power-hungry villain who plots to rule the world by unleashing a horde of malevolent animals. Aside from the fate of the world hanging in the balance, Leonard has his own problems. His wife, for instance, who hasn’t returned his phone calls for seven years. Not to mention a teenage daughter whose performance in a stage play includes removing her clothes. Needless to say, doffed duds don’t delight Dad. So, some parts of Leonard—the better parts—deal with the nutty family material. 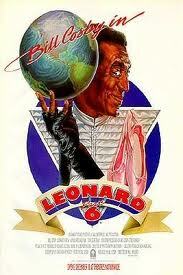 Which is, after all, the territory Cosby has parlayed into America’s most popular television series. Maybe if he’d stayed close to where his heart is, a decent movie might have resulted. But the spy stuff, which makes you nostalgic for Robert Culp, is weird business. It verges on surrealism when the animals are finally turned into killers, as with the attack of the crazed rainbow trout, and a lobster assault that is repulsed with melted butter. And there is a scene of killer rabbits, which have been absent from the headlines since the 1980s, when Monty Python and the Holy Grail explored the problem and Jimmy Carter fought one off while in his dinghy. If this new adventure were confiscated, it might be in everyone’s best interests—particularly those of Bill Cosby, who’s perfectly right to be embarrassed. Columbia in the 1980s: a very peculiar time. Nothing good can come from further discussion of this film. I usually manage to find a way to avoid going to see full-length animated features. I’m really not sure what it is about the format that holds so little allure for me, but I’ll almost always grab any excuse that will help me steer clear of a 90-minute cartoon. Perhaps it’s because, although animation methods have improved technically since the days of Disney’s Snow White and the Seven Dwarfs, the art form does not seem to have grown imaginatively. Snow White still shines as a triumph, and most modern-day animation looks withered next to it. But an animator named Martin Rosen made a movie a few years ago called Watership Down that was a vibrant rebuke to this sad trend. Seeing his name in the credits of The Plague Dogs made it easier for me to drag myself to this new animated feature. Like Watership Down, this one is based on a novel by Richard Adams, and has talking animals as its main characters. So I was prepared for a movie where dogs spoke with British accents. Okay. What I wasn’t prepared for was that The Plague Dogs would be so compelling. It’s not just that the animation is impressive. It is; but the story is startlingly engrossing and uncompromising. Two dogs at a research laboratory have been undergoing painful tests for some months. 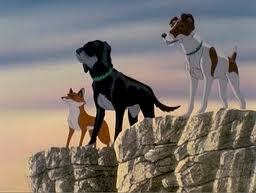 One night, they sniff a way out into the English countryside, and delight in their freedom. But they find mere survival quite a struggle, and soon they’re the subject of an intensive search: they may have been exposed to some plague virus at the laboratory. With the help of an uncharacteristically trustworthy fox, they learn how to scavenge and even kill to survive. The scenes in which they trap and eat sheep are surprisingly graphic. Indeed, some elements of The Plague Dogs may be disturbing to younger children, especially the harrowing atmosphere of the research center and the accidental death of a hunter caused by one of the dogs. However, these elements are also what make the film admirable. It is so powerful in large part because it is unflinching. There’s nothing icky or cute about these cartoon characters and situations; the stakes, after all, are life and death, and if a film—even an animated one—is going to deal in those terms, it may as well do it without blinking. The personalities of the dogs are—pardon the phrase—well-drawn; Snitter, a sharp-witted terrier, is giving to occasional hallucinatory experiences, thanks to the fact that some of his gray matter was lifted out by scientists. Rowf is a skeptical black Labrador who vows not to let the “Whitecoats” take him back alive. Given that set-up, there is slim chance of the customary happy ending. And The Plague Dogs offers an odd, bold alternative. I won’t say what it is, but I found it strangely moving, and rather courageous—an appropriately offbeat ending for an animated feature made unusual by its quality. This is the film’s American premiere engagement. “May be disturbing for younger children.” Well, I am known for understatement. This is one traumatic movie, and it will be too disturbing for most adults I know. This is from the days when Seattle was a popular market to launch misfit movies, and The Plague Dogs certainly qualifies; a cartoon guaranteed to keep a young audience away—who is this movie for? It was very good, and Martin Rosen went on to make an interesting 1987 live-action picture, Stacking, but I don’t know where he went after that, except for an IMDb listing about a Watership Down TV series. It’s kind of interesting to recall this pre-Little Mermaid moment when feature animation really was in a long period of doldrums, from which it didn’t seem particularly likely the form would recover. Feature animation still interests me less than just about any other kind of moviemaking, but the quality level has gone way, way up. A modern-day cowboy-scientist (Stephen Collins) has a huge high-tech research lab somehow contained within a mesa in the Southwest. Place called (yup) Choke Canyon. For some insane reason, probably geophysical (a term I use because I’m not quite sure what it means), the canyon area serves as a kind of nature’s tuning fork—or nature’s lightning rod—well, all this cosmic energy gets zapped down in there somehow. Collins realizes that this discovery could mean the end of fuel consumption as we know it, and bring peace and prosperity to all the peoples of the world. Sounds like he’s nuttier than a Mr. Goodbar, but the movie asks us to take this seriously. Oh yeah, and the only way to prove the theory is to tap in to the cosmic source as Halley’s Comet is passing by, which, as the movie has it, is about to happen. There’s more. The evil superconglomerate that owns Choke Canyon (Collins is leasing the spot) wants to dump its toxic waste there. They have to get Collins out of the way. They wreck his computers, ruin his home, and insult his horse. And the icy company hatchet man (Lance Henriksen, the android from Aliens) sends a paid thug (Bo Svenson) to rub out Collins personally. But don’t count the cowpoke out. He kidnaps the daughter of the conglomerate’s chief executive officer and insists that his computers be put back in time for the comet’s arrival. Some of this sounds like fun, right? It’s not. Director Chuck Bail prods things along, but he’ s obviously waiting for the big stuntman’s-heaven finale, in which Collins’ helicopter, carrying a tank of toxic waste, is chased across Utah by the bad guys in the biplane. There’s some flashy stunt flying here, and the film perks up, but it’s too late the save the show. The blond, dimpled-all-over Collins is no longer the dashing young actor on the verge of becoming a star. (Remember Star Trek—The Motion Picture?) He’s actually better with age, although he does walk around a lot with a “Why couldn’t I have played Indiana Jones?” look on his face. The answer to that question is provided by his barely registered presence during this film. All that, and Halley’s Comet, too? Henriksen and Svenson as the bad guys? You wonder how it could miss. Chuck Bail was a veteran stunt guy and actor who also directed Cleopatra Jones and the Casino of Gold and The Gumball Rally. You are currently browsing the WHAT A FEELING! blog archives for August, 2011.